For many people today, the thought of letting a child train in the martial arts – boxing, karate, wrestling or the growing practice of historical sword combat called “Western martial arts” – is objectionable. Kids are already exposed to too much violence in video games, TV programs and movies. When our society is plagued by problems of real violence at every level, why would we encourage kids (or, for that matter, adults) to take part in a recreational activity that turns physical conflict into a game? But just because martial arts involve grappling, throwing punches and swinging swords doesn’t mean they are synonymous with violence. These physical activities, coupled with an understanding of a sense of respect, dignity and trust, may actually reduce violence in society. Studying the arts of violence may diminish the urge to commit violent behavior – a paradox that is at the heart of the code of chivalry. In this essay, excerpted from an opinion piece in the Sydney Morning Herald, Prof. Damon Young explores the aggressive tendencies of youth (boys in particular) and considers how a grounding in the martial arts may be an important part of a concerted social campaign against violent street crime. His thoughts about young men learning to channel their aggressive tendencies are echoes of the philosophers of the Middle Ages who wrote about the importance of chivalry. Studies show that martial arts training can help make young men more calm and disciplined, and less prone to criminal violence. I was a schoolboy once, and I can understand the allure of macho posturing and physical confrontation. But when the boys are grown men, it’s not so innocent. Boys get grazes and bruises, but drunk adults die from brain injuries, knife cuts and bullet wounds. Some of the idiocy may be stopped by a greater police presence, more arrests, harsher sentences. Media campaigns might change some minds – well, it worked with drink-driving. But it won’t dissipate the rampant male aggression, particularly the explosive, adamant and irrational rage that often clouds the minds of young men. This sounds like an excuse – it isn’t. It’s a partial explanation. Young male rage brings with it all sorts of identity issues: masculinity, sexual desirability, ennui and socio-economic factors. But from poor ethnic gangs to white, middle-class private school boys brandishing bats, is a common ferocity: angry, swaggering, immature aggression. The question isn’t how to get rid of it, but: what can we do with it? How can we channel this into something less dangerous, and more productive? There are many ways to do this constructively, but one is martial arts: teach boys how to fight. Take them to classes, like boxing, judo, karate, kung-fu, ju-jitsu. This seems absurd: surely learning to fight means more violence. Certainly, some young men are made more violent by martial arts – the macho atmosphere and praise for violence enhance their aggression, instead of diminishing it. And some professional fighters seem to grow more angry and unbalanced as they age. But research suggests that young men who learn to fight in a safe, structured, respectful martial arts school are less antisocial. How does this work? 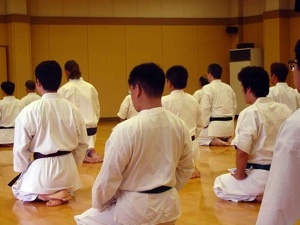 First, the martial arts offer controlled catharsis. They get to fight, and fight hard – but against willing participants, under the eye of an experienced teacher, coach or trainer. They learn to be aggressive without being malicious. Second, combat sports can increase self-esteem. Instead of needing to prove themselves in animalistic rites, martial artists enjoy genuine achievements: gaining grades or belts, executing difficult techniques, winning competitions. They learn there are better ways to get respect. Third, fighting offers discipline. You have to train regularly, eat well, keep your fitness up, and set realistic targets. Maybe young men can combine this with Friday night drinks and thuggery, but it won’t pay off in the long run. Success demands commitment, and this means less late-night idiocy and more early morning jogs. Fourth, fighting can teach humility. Confidence can spill over into arrogance, which can lead to more infantile self-assertion in the city. But there’s nothing like losing a fight to teach you your limits. Boys need to learn they’re not invulnerable – as a colleague of mine, a fine arts graduate, put it, “every 15-year-old boy needs to be punched in the face”. Finally, the martial arts demand trust. In order to train well, you need faith in your teacher and fellow students. You have to know they’ll go light when you’re a beginner, and they’ll release their choke when you tap – and you’ll do the same. In this way, young men learn to be less antisocial, and more gregarious; they learn trust in others, and self-restraint. It’s no panacea; psyche and society are too subtle and complex for any universal policy to work. But it’s food for thought: don’t deny male rage, channel it into something safe and structured. Instead of just policing the streets, we might educate the angry mind. If we want them to be more civilised, perhaps we must teach our boys to fight.